Snow, a nation of wusses? 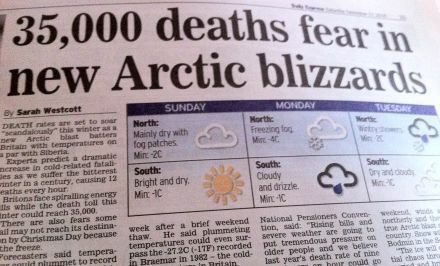 We do not handle “weather” very well here in the UK, in fact despite what the 24 hour news channels and certain newspapers will have you believe, we never really have extreme weather of any kind. After many warm winters, there has been a generation of people that grew up without even seeing snow, so when the white stuff decides to make an appearance again as scheduled in winter, the nation seemed to get its knickers in a twist. In February we were told that the killer snow was the worst in 18 years as terms such as chaos, arctic conditions, snowpocalypse and snowmageddon rapidly became the norm. Snow in winter who would have thought it? But gone are the days of winter weather being the norm, in fact in these health and safety obsessed times, Royal Mail bosses even stopped postal workers from delivering the mail due to the harsh weather conditions which were literally a few inches of the white stuff. UK media stretches the truth a little.